Some people buy. Some will never buy. Some need the product but didn’t buy. How do you convert that last group of people? 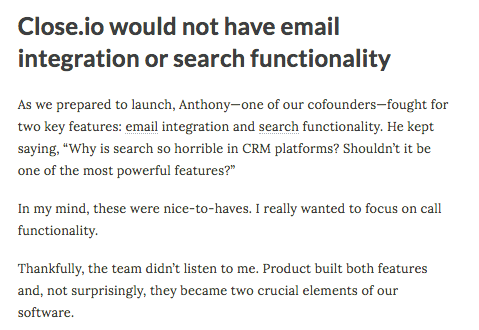 Close.io is the sales tool built by sales professionals and their founder’s weekly emails are the near perfect conversion tool. They’re emails that link to content you want to read that also plugs the product without direct advertising. Why do new users fail to buy even when they need your product? They don’t know and trust you yet. They have a problem but are not sure your product is the best fix. It’s not the right time and there is no urgency. Some people need multiple touch points to build up conviction. Drip marketing campaigns work by building up trust, explaining the product from different angles the reader can understand, reminding users when the time does become right and helping them build up conviction. They’re essential to converting the majority, who didn’t buy straight away, over time. Who are close.io and why are they good at sales? The Close.io team were an outsourced sales service. 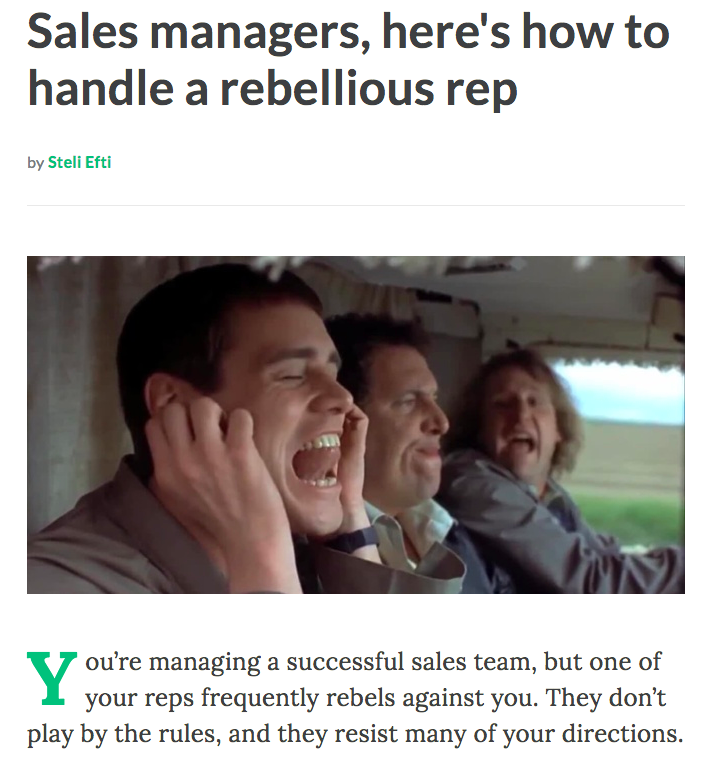 If you wanted to make sales, you’d hire them to do it. They eventually built their own product and because they’re good at selling, they’ve grown rapidly and they've recently added their own drip email feature. 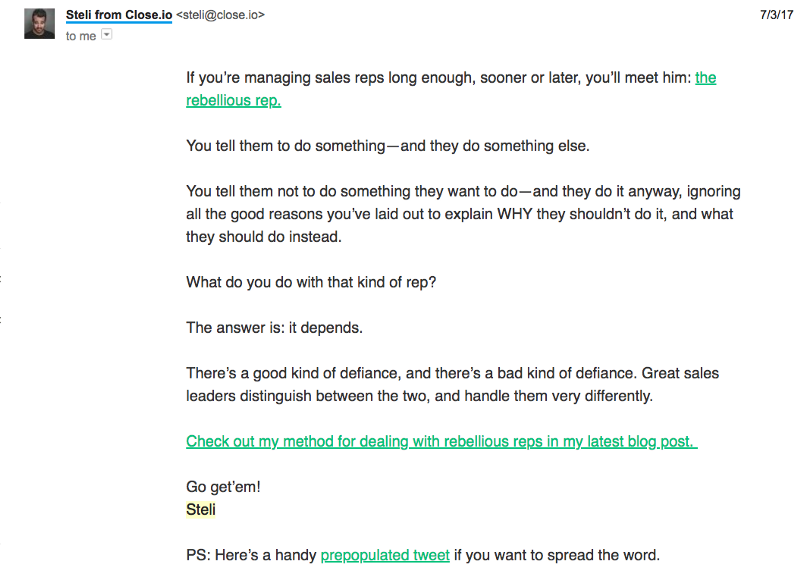 Below is an email from Steli from Close. What’s good about the email? The first line of the email is, just like the header, catchy and built to keep you reading. There’s lots of one and two line sentences so it’s great for mobile phones. No-one wants to read huge paragraphs. He uses ‘bucket brigades’ by asking a question half way through that keeps you reading. They create an opening in the mind we feel the need to fill. There’s a link at the top to encourage the impatient user to click. He repeats the link at the bottom. The font is larger than normal making it clear to read. The link is in a nice bright green which welcomes a click. If you run drip email campaigns you’ll notice how much they drop off over time, especially after the first week. Yet, if you have an email with a good subject header, the open rate shoots up. Close.io do not do boring headlines, ever. 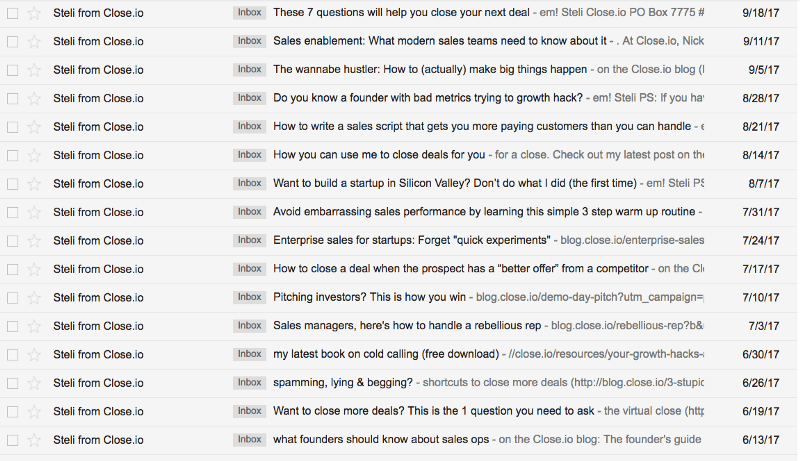 Some of the emails I’ve received from Close.io over the last year. Here is the top part of the blog post linked to that email. This top section gets your attention by giving you an ‘Agree’ statement. There’s a copywriting formula called ‘APP’ for writing introductions to catch your attention in 2 seconds. APP stands for Agree, promise, preview. First make a statement people will Agree with, which is often a problem statement. This catches their attention and stops them leaving. Then, Promise them that this article will show them the solution by writing a brief sentence on what the article will give them for reading it. Finally, give them a Preview (taster) that proves you’re for real. The Close.io blog starts with a simple statement that anyone running any team probably encounters at one point or another. It’s easy to agree with. They talk about their own experience which is an easier post to write and provides proof. Using a drip campaign tool like Intercom? What has team Upscope learned from this? Within Intercom we have the ability to send sequences of emails to specific segments, we need to make sure we capture those segments in the sign up so we can send segment specific emails but… see next point. We can use the Close.io example to send valuable and experience based emails on a range of subjects because some stories are universally interesting. If the contents are good then it also feels good to write that catchy title and not feel like we’re making click bait.